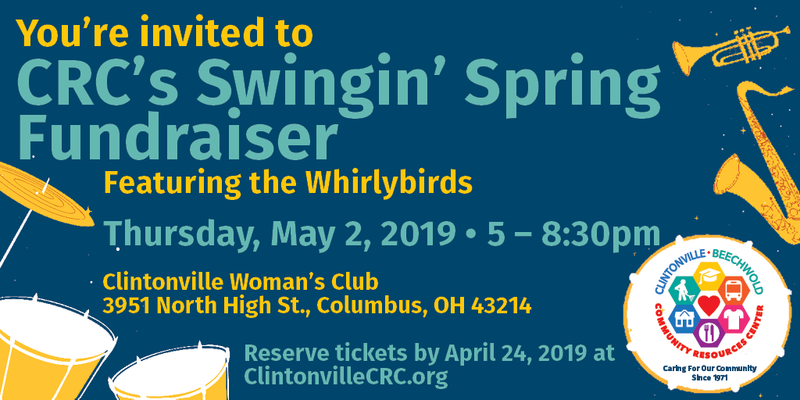 Join the Clintonville-Beechwold Community Resources Center for our Annual Swingin’ Spring-Fling Fundraiser! Our event will take place at the historic Clintonville Women’s Club on Thursday, May 2nd, 2019. Social hour: 5pm – 6pm, Plated Dinner: 6pm – 7pm, Live Entertainment featuring the Whirlybirds: 7pm – 9pm, “Whirlybirds brings you exciting, original ‘swang’ music to get your toes tapping and your heart singing.” Ticket purchases and sponsorship’s support the work of the Clintonville-Beechwold Community Resources Center. RSVP by April 24th by completing the form below.